Sibu congkan 四部叢刊 "Collectanea of the Four Categories"
The Sibu congkan 四部叢刊 "Collectanea of the Four Categories" is a collectanea compiled by the Republican period (1911-1949) scholar Zhang Yuanji 張元濟 (1867-1959). It includes 504 texts arranged in three series, 350 books in the first series (Sibu congkan chubian 四部叢刊初編), 81 books in the second series (Sibu congkan xubian 四部叢刊續編), and 73 books in the third series (Sibu congkan sanbian 四部叢刊三編). Zhang Yuanji, courtesy name Zhang Junsheng 張菊生, came from Haiyan 海鹽, Zhejiang, and was a secretary (zhushi 主事) of the Ministry of Justice (xingbu 刑部) and a secretary (zhangjing 章京) in the Court of Colonial Affairs (zongli yamen 總理衙門). Because of his participation in the Reform movement of 1898 he was dismissed and from then on dedicated himself to the publication of books as director of the Commercial Press (shangwu yinshuguan 商務印書館) in Shanghai. He was responsible for the publication of the Bona edition 百衲本 of the twenty-four official dynastic histories (Ershisishi 二十四史), the three series of the Sibu congkan, and the collectanea Xu guyi congshu 續古逸叢書, a sequel to the Guyi congshu 古逸叢書. After the foundation of the People's Republic of China he was chosen as a member of the National People's Congress (quanguo renmin daibiao dahui 全國人民代表大會). Zhang Yuanji has written the essay Jiaoshi suibi 校史隨筆 and the catalogue Hanfenlou jinyu shulu 涵芬樓燼餘書錄 (see Hanfenlou miji 涵芬樓秘笈). The three series of the collectanea Sibu congkan are arranged according to the four traditional categories of literature, namely Confucian Classics and their commentaries, historiography, "masters and philosophers", and belles-lettres. The books includes are important texts through the ages. All texts are based on excellent old printings, as collected in the Hanfenlou Library 涵芬樓 and other precious collections. Most texts are based on Song 宋 (960-1279) and Yuan 元 (1279-1368) period prints, and the facsimiles to these texts have been produced with great care. Some texts are facsimiles of manuscript versions from the Ming 明 (1368-1644) and Qing 清 (1644-1911) periods. 72 books are based on Song period texts, 2 on texts produced in the Jin empire 金 (1115-1234), and 34 date from the Yuan period. The most precious Song period prints are that of the Classics Shijing (Maoshi 毛詩), Mengzi 孟子 and Erya 爾雅, as well as the history Zizhi tongjian 資治通鑒 and its text-critical appendix Zizhi tongjian kaoyi 資治通鑒考異 and the index Zizhi tongjian mulu 資治通鑒目錄. The Sibu congkan has been produced with the help of lithographic reproduction. It is thus not only very important for the easy access to ancient texts to the public, but also because it preserves a lot of early prints. The first series was published in 1919 and was reprinted in 1929. In this second edition, 21 texts were produced in a better version than in the first edition. In 1936 a downscaled version was published, the so-called Suoben Sibu congcan chubian 縮本四部叢刊初編. The second series was first published in 1934, the third series in the years 1935 and 1936. The Zhonghua press 中華書局 published a facsimile of the second series in 1984, and a year later, the Shanghai Press 上海書店 published a facsimile edition of part of the second and third series. Li Xueqin 李學勤, Lü Wenyu 呂文鬰 (1996). Siku da cidian 四庫大辭典, vol. 2, p. 2106. Changchun: Jilin daxue chubanshe. Shanghai tushuguan 上海圖書館 (ed. 1982), Zhongguo congshu zonglu 中國叢書綜錄, vol 1, pp. 285-297. Shanghai: Shanghai guji chubanshe. 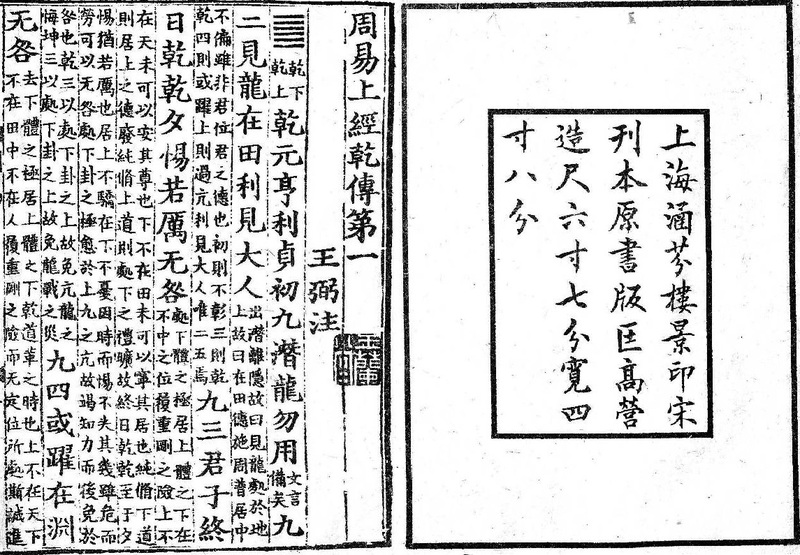 Impressum and first page of the Confucian Classic Zhouyi 周易 (Yijing 易經) in the collectanea Sibu congkan 四部叢刊. The impressum says that the Hanfenlou Studio 涵芬樓 in Shanghai reproduced a Song period print as a facsimile (jingyin 景[影]印). The size of the original frame (bankuang 版匡[框]) is 6.7 × 4.8 inches according to the carpenter's foot (yingzao chi 營造尺). 群書治要 五十卷 Qunshu zhiyao (Tang) 魏徵 Wei Zheng et al. (Qing) 呂培 Lü Pei et al. Shanghai tushuguan 上海圖書館 (ed. 1982), Zhongguo congshu zonglu 中國叢書綜錄, vol 1, pp. 285-294. Shanghai: Shanghai guji chubanshe. 儀禮疏 五十卷 Yili shu (Tang) 賈公彥 Jia Gongyan et al. 春秋正義 三十六卷 Chunqiu zhengyi (Tang) 孔穎達 Kong Yingda et al. 爾雅疏 十卷 Erya shu (Song) 邢昞 Xing Bing et al. app. Suoyin (Qing) imp. ord. 蕭冰厓詩集拾遺 三卷 Xiao Bingya shiji shiyi (Song) 蕭立 Xiao Li et al. Shanghai tushuguan 上海圖書館 (ed. 1982), Zhongguo congshu zonglu 中國叢書綜錄, vol 1, pp. 294-295. Shanghai: Shanghai guji chubanshe. 尚書正義 二十卷 Shangshu zhengyi (Tang) 孔穎達 Kong Yingda et al. 禮記正義 (殘) 九卷 Liji zhengyi (Tang) 孔穎達 Kong Yingda et al. 太宗皇帝實錄 (殘) 二十卷 Taizong huangdi shilu (Song) 錢若水 Qian Ruoshui et al. 太平御覽 一千卷 Taiping yulan (Song) 李昉 Li Fang et al. Shanghai tushuguan 上海圖書館 (ed. 1982), Zhongguo congshu zonglu 中國叢書綜錄, vol 1, pp. 294-297. Shanghai: Shanghai guji chubanshe.